In B2B marketing can you simultaneously inform with brilliant content while also entertaining? 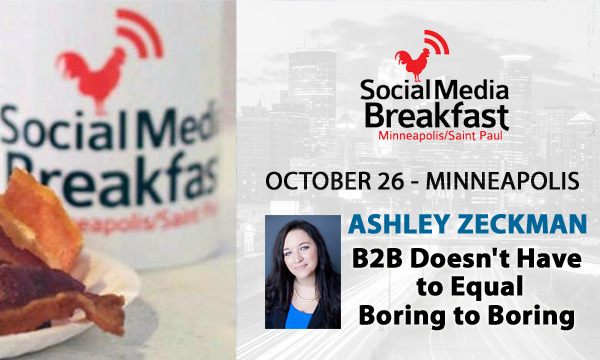 Learn to inform, engage and delight in B2B marketing with TopRank® Marketing’s noted Digital Strategy Director Ashley Zeckman, who will be speaking Friday, October 26 at the Minneapolis-Saint Paul Social Media Breakfast’s Social Media Case Studies event. October 26, 2018 Minneapolis-Saint Paul Social Media Breakfast’s Social Media Case Studies event. B2B marketing has gotten a bad rap. Often B2B campaigns are long, boring and filled with far more information than is needed. But what if there was a way to speak to the needs of a business audience, while also entertaining them? For the sixth year in a row, TopRank Marketing partnered with Content Marketing Institute to develop a campaign to drive awareness for their annual conference, Content Marketing World. This campaign aligned closely with the gaming theme of the conference and included an ultimate guide and a killer combination of social media imagery and videos. In this session, TopRank Marketing’s Ashley Zeckman will take a dive into how her team constructed this campaign and amplified the content on social media with the help of influencers to drive stellar results. Be sure to follow Ashley at @azeckman and the event’s Twitter hashtag #SMBMSP, and take advantage of a great opportunity to hear her speak. Registration and conference details are available on the event website. If you’d like to learn more about our influencer marketing and other career opportunities, visit the TopRank Marketing careers page.